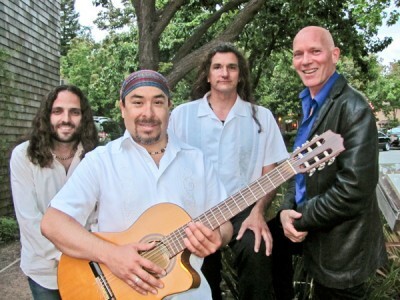 Entertaining crowds at summer concert series’, music festivals and cultural events since 1999 with its passionate and distinctive blend of instrumental Latin Guitar World Fusion. David Correa and CASCADA have toured throughout the west coast, northwest & southwest regions and have won numerous accolades and awards including best Latin band in the North Bay three years in a row from 2005 through 2007. Signed to prestigious Baja/TSR Records in ’06 and releasing “Rumba de la Selva” in 2007. in 2008 “Gypsy Spice” Best of New Flamenco was released and featured the track “Linda” from “Rumba de la Selva” along side artists such as Ottmar Liebert, Jesse Cook, Armik, Young & Rollins, Luis Villegas & Benise. David Correa and CASCADA continue to win over the hearts of Bay Area fans while spreading their music throughout the West Coast & Southwest areas.